Children’s laughter echoed against the high ceilings and white cinderblock walls of the Housing Authority of the City of Milwaukee’s Community Services Building, 650 W. Reservoir Ave. The room below was lined with three crowded long tables dotted with balloon bouquets and confetti shaped like stars and hundred-dollar bills. It was all part of a recent ceremony honoring the 88 graduates of the “Make Your Money Talk” financial education series, with about 40 in attendance. The free nine-hour “Make Your Money Talk” class series was begun by the address Wisconsin Women’s Business Initiative Corporation (WWBIC) in 2004 and has since minted more than 2,100 graduates. 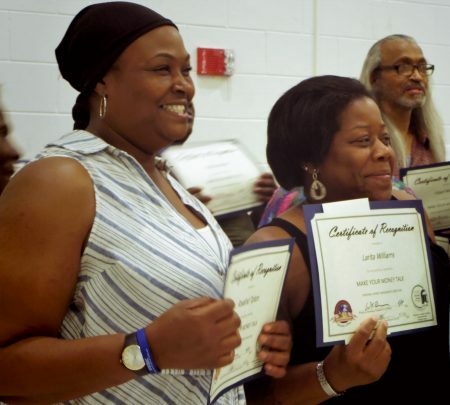 Although the class is offered in other Wisconsin communities, the Milwaukee program that runs in partnership with the Housing Authority of the City of Milwaukee is the largest in the state. WWBIC President Wendy Baumann said that the classes involve working with participants to develop spending and savings plans to help achieve specific long-term financial goals. She added that graduates often stay in touch with WWBIC financial counselors for years. A prime example is Sean Williams, who works in the Potawatomi casino floor bar and has lived in public housing since 1997. Williams said he first took a “Make Your Money Talk” class in 2005. Over a decade later, he has just received preapproval for a housing loan and is hoping to move into his own home by September. In addition to financial education classes and guidance, Milwaukee Housing Authority residents who participate in the program are eligible to open a “Match Savings Account” to help finance a home, education, business, debt payment or the purchase or repair of a vehicle. These special bank accounts match savings at a 4:1 ratio up to $500, ultimately yielding up to $2,500. Marcus Alamina, a WWBIC financial capability coach, estimated that roughly 70 graduates had applied for an account by the time of the graduation ceremony. Graduate Quinesha Cole, 26, received her culinary degree in 2006. Now, she’s planning to use her Match Savings Account funds to help start her own catering business. “We’re excited that we’re one step closer to that goal,” added Tiffany Johnson, Quinesha’s mother and fellow graduate. For many program alumni, the Match Savings Account has continued to “pay dividends,” so to speak. Alumna Brittany Hughes, a 29-year-old who spoke at the graduation ceremony, took the class with her husband James last fall. She said that her ongoing relationship with the program’s financial coach has helped her to improve her credit score and secure a housing loan. The Hughes’ used their Match Savings Account funds toward the down payment on their first home. They closed on it in April. “I feel like sometimes we limit ourselves in the things we do and the goals we reach for, but all you have to do is keep trying,” Hughes said in a phone interview. She said she would strongly encourage other Milwaukeeans to enroll in the course. 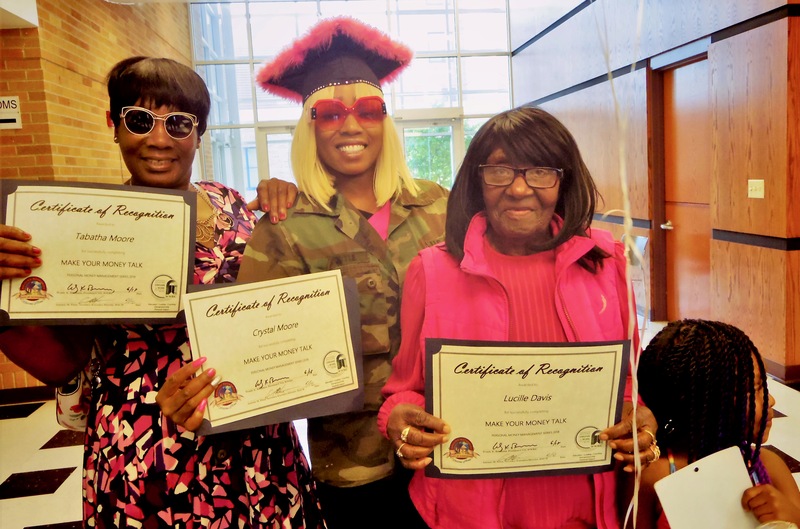 The ceremony included opening remarks from WWBIC and Housing Authority officials, a keynote by Mayor Tom Barrett, presentation of graduation certificates and a gift card raffle and children’s coloring contest. The “Make Your Money Talk” class runs several times per year, with the next session starting in late July. Call (414) 263-5450 to sign up for the next class.